The twinkly flashing lights of fireflies are a classic sign of summer, but the insects aren’t blinking for your aesthetic benefit. They’re courting in an absolutely cutthroat meet market, and some scientists are afraid that human activities could be making it harder for them to succeed. This summer, you can help figure out whether that’s true. The Museum of Science in Boston, in conjunction with entomologists from Fitchburg State University and Tufts University, hosts Firefly Watch – a long-running citizen science project that collects data about where fireflies are found, where they’re absent, and whether human factors like streetlights or lawn mowing affect these flashy beetles’ survival. To participate, sign up at the Firefly Watch site and describe your yard with their online forms. Then spend ten minutes each week this summer watching the males and females flash at each other. 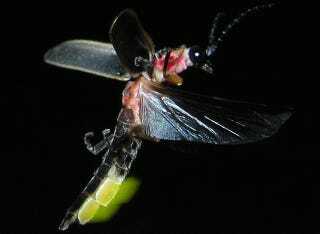 You’ll look for the color of their bioluminescent light and the patterns of their flashes, both of which help biologists figure out which of the many species of fireflies live near you. And if you don’t see any beetles courting in the dark, those data are just as important - they can help trace where the beetles are dying out because they haven’t been getting it on.